The Asia-Pacific region has witnessed a rapid rise in bilateral preferential trade agreements at the beginning of the twenty-first century. This trend could have potentially dramatic effects on the trading patterns of countries in the transpacific region and beyond. Some argue that these accords will spur multilateral negotiations, while others believe that they will irreparably damage the trading system. 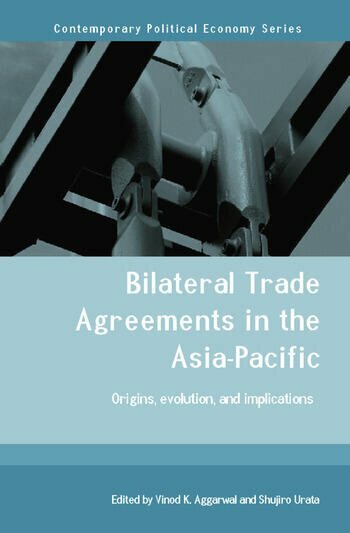 Bilateral Trade Agreements in the Asia-Pacific examines the underlying political and economic factors driving these accords, based on a novel theoretical framework. Experts then provide overviews of political and economic trends in the region as well as detailed analysis of the trade strategies of Japan, China, Singapore, South Korea, Malaysia, Taiwan, Thailand, the United States and Mexico. By systematically evaluating and assessing the driving forces underlying the turn to bilateral trade agreements in the Asia-Pacific, this book provides the first comprehensive analysis of this crucial phenomenon. Growing numbers of countries both in the region and elsewhere in the world are now considering further negotiation of bilateral trade accords. Understanding how these arrangements will fit or conflict with existing institutions in the Asia-Pacific and the WTO makes this book imperative reading for policy-makers and scholars.